Long-awaited new edition of the classic text on large animal neurology. Written by one of the worlds leading experts, the book reflects his considerable experience gained in America, Australia, New Zealand and Britain. This practical reference is a complete guide for all veterinarians in handling large animal neurologic cases. It is richly illustrated in full colour throughout, with 200 colour photographs plus detailed line drawings. In addition a wide variety of diseases are brought to life in video clips on the accompanying DVDs. This invaluable video library provides examples of actions, movements, postures and syndromes, and helps to visualise the definitions of clinical signs described in the text. 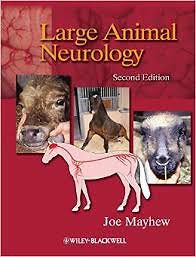 Part I provides the information needed by the clinician to approach large animal neurologic cases. Part II contains clinical discussions of clinical syndromes caused by diseases of the nervous system commonly encountered in practice. Part III is new for the second edition, and describes mechanisms and most specific neurologic diseases of domestic animals, with frequent cross-references to the clinical problems in Part II. This second edition reflects the considerable advances in the understanding of neurologic diseases, diagnostic modalities and treatment options since the first edition published in 1989.